'A fascinating book which I wholeheartedly recommend' Chris Gray, The Oxford Times. 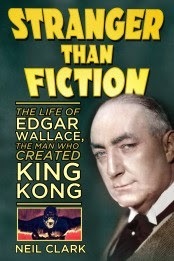 I'll be signing copies of my new book 'Stranger than Fiction, The Life of Edgar Wallace, the Man who Created King Kong', at WH Smith's 22, Cornmarket Street, Oxford on Saturday 28th February from 10am- 4pm. If you'd like a signed copy but can't get to tomorrow's signing, copies can be ordered via the form on the top right. Forget all our other troubles- the Russians are coming! My new piece on the Russian 'threat' can be read here. This new piece of mine appears in today's Daily Express. He was the man who created the most famous fictional detective of all time. Sir Arthur Conan Doyle gave the world Sherlock Holmes but in 1907 the author decided to play detective in real life. He set out to solve the mystery of what had been called the Great Wyrley Outrages- and clear the name of a man who he believed had not just been wrongly convicted but was also the victim of racial prejudice. My new feature on Edgar Wallace- pegged to my recently published biography of the prolific author- in today's Daily Express. Above you can watch my latest interview for RT on the ever-worsening situation in Ukraine. You can read the whole of my Daily Express piece on the history of the British passport here. The latest interview with me on RT, on the extension of EU sanctions against Russia.